one of the most disconcerting things about arriving in pampanga is that after passing swiftly by idyllic farmland and sleepy towns, once you turn off the main highway, you run smack dab into a california-style mall. it's like a high speed cruise through bali, only to end up in burbank. luckily, our town is a bit further off, so you regain your bearings with each bump and puff-o-dust in the supposedly paved road; the road itself narrows, cars and commercial buildings become a little more scarce, and the trikes and mopeds take over the traffic. soon, you are greeted by a little stand on the side of the road. that's cecile's, and she makes bibingka. 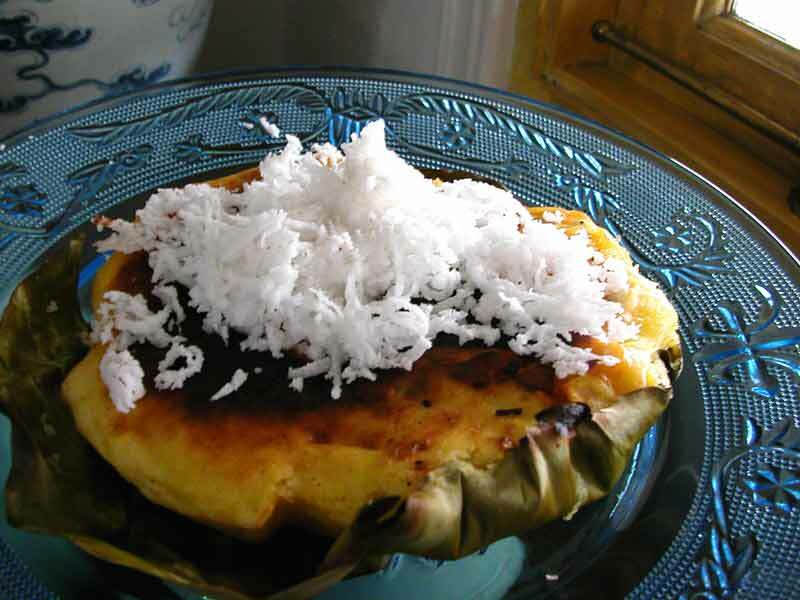 bibingka is a cake traditionally made from a batter of ground rice flour, eggs and coconut milk. while it is baking, salted duck eggs and quesong puti, a semi-soft white cheese made from carabao's milk (similar to bufala mozzarella) are added; once baked, it is topped with snowy drifts of freshly grated coconut. baking the bibingka is no small matter. 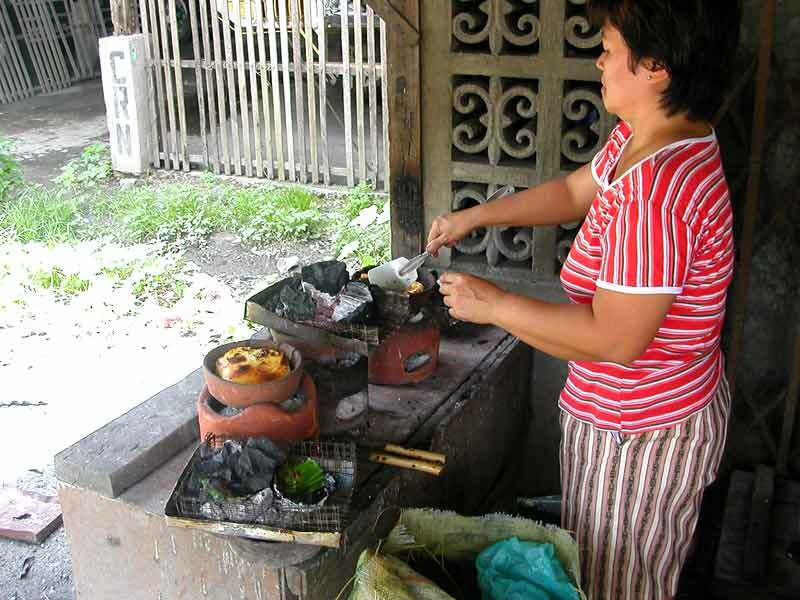 the batter is poured into a clay pot or coconut shell lined with banana leaf--the leaf is there to make it easier to lift the bibingka out, but it also imparts a wonderful aroma to the cake. the pot is placed on small clay coal-fired oven, and then a metal tray covered with more of the hot coal is placed on top of the pot, and the cake is carefully watched for a few minutes until it has gently risen, the cheese has melted, and the top has browned and blistered. once out, the leaf-lined cake is wrapped up in more banana leaves to keep it warm and toasty; then some newspaper, with a generous bag of grated coconut wrapped within, a final bind of twine and you are sent on your merry little way. there have been a few discussions on message boards as to the origins of bibingka, along with my own musings on foreign influence in baked goods in the philippines, so i won't get too much into it. 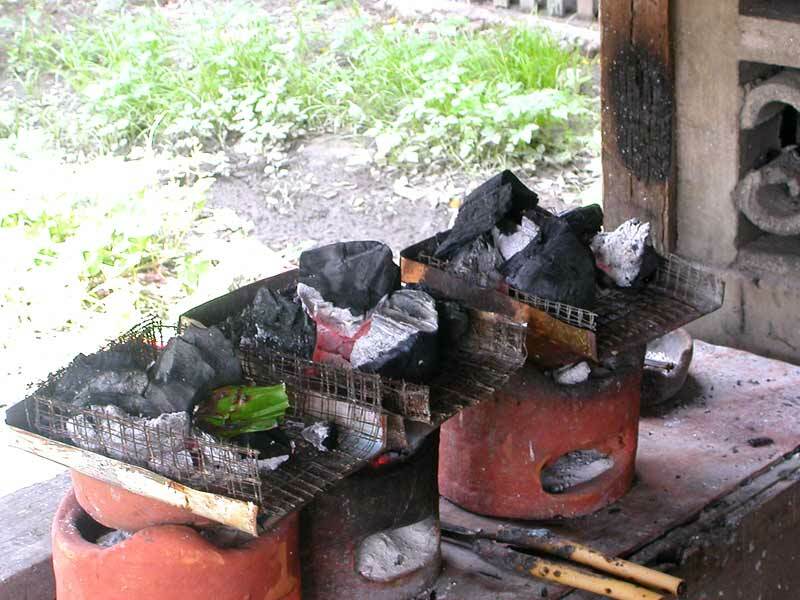 however, it is clearly a product of the many cultures that have passed through the country--the portuguese have a similar delicacy called bebinca, which is also found in indian region of goa and in the island of timor; the clay ovens were brought to the philippines centuries before by the chinese. it is one of the very few recipes that i think does not travel well. you can make various substitutions to the main components to some degree of success, but without the banana leaf and clay oven, the elusive alchemy is unachieved, and you are left with a pale imitation of the real thing. once you are lucky enough to taste the springy, mildly sweet cake, with its leafy fragrance, and eggy richness complemented by the crumbly, salty egg, sweet, warm cheese, and fresh, milky coconut all imitations fail. 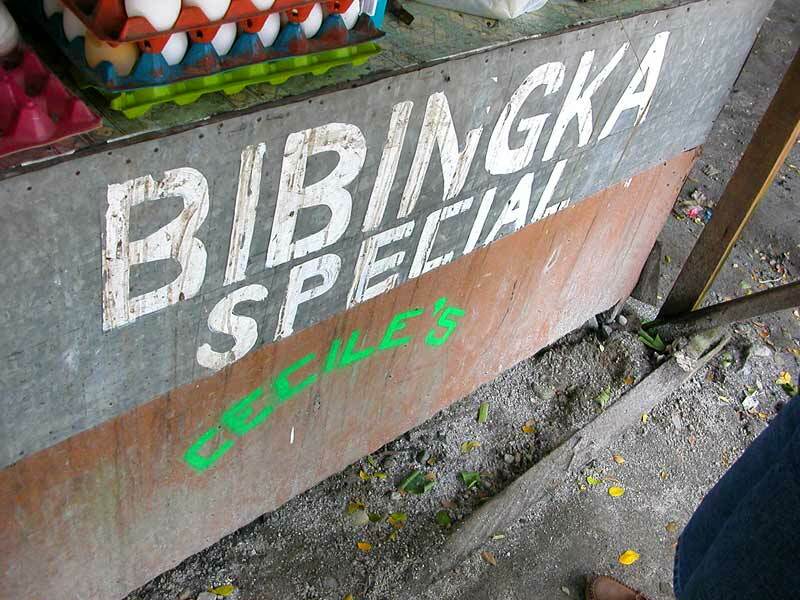 bibingka is not a native specialty to pampanga, but its true self can only be found in the philippines. seek it out if you find yourself here. Posted by santos. This entry was posted on 20050901 at 2:25 AM You can skip to the end and leave a response. Freshly grated coconut is really nice. One of my favourite local snacks is ondeh ondeh, which is this starchy blob with a liquid core of gula melaka (palm sugar) rolled in freshly grated coconut. Sticky chewy milky gooey and salty sweet all in one mouthful. And it's luminous green. hi shukumei! do they look something like the kanom tom in this post? the ingredients sound similar, if not the same. those were soooo tasty! yeah, they do! but the filling is just pure sugar, no coconut. Hmmm... I'm actually on a mission to recreate the old Sta. Rita bibingka which was thinner but denser and more 'sticky' - no eggs or half an egg per cake at most. You had to ask for it if you wanted a whole one. Remember Dang Luming who had her stall by the San Vicente chapel? I think her daughter still has the recipe but I've not been to her yet. No baking powder either. They used day-old rice as leavening. Come home again soon, we can do the project together. hi shukumei--those sound so good. hi karen--my mom insists there was cake yeast involved in the old recipe, but perhaps hers isn't old *enough*. she says it is ground rice, water, and yeast. you're more than welcome to try it out. I haven't seen bibingka cooked that way in...forever!! That sure brings back memories or midnight mass and bibingka for a midnight snack. hi jmom! now i just have to find some puto bumbong that's actually cooked in bamboo! Thank you, this is a really interesting post. I live in Hawaii and am familiar with the "Americanized" version of Bibingka...though I didn't realize it had been americanized until i read your post! Here it is served as a coconutty dessert, sans duck egg and cheese. hi monika! do they use banana leaves in hawaii? i can skip the duck egg and cheese if it's cooked in a banana leaf--i like the flavour it imparts. The variation of bibingka in my hometown in Cavite is that it's way bigger (about 10-12 inches in diameter), never have quesong puti or salted egg in it, only rice galapong no wheat flour (so cake is white not yellowish) and just have caramelised butter/margarine and sprinkled sugar on top. You're right, bibingka is not nice when cold. It's best to eat it warm almost straight from the clay oven. hi celia! that sounds so good. does it have any leavening agent in it? maybe the cavite recipe is the one that karen is looking for. Hi! there missed so much this Bibingka in Pampanga. I'm actually a Kapampangan and now based in Davao. Pls. share in ur blog the complete ingredients and the procedure of cooking it. I love also puto bumbong. Pls. feature this in ur blog too. Nice blog. Have a great time!